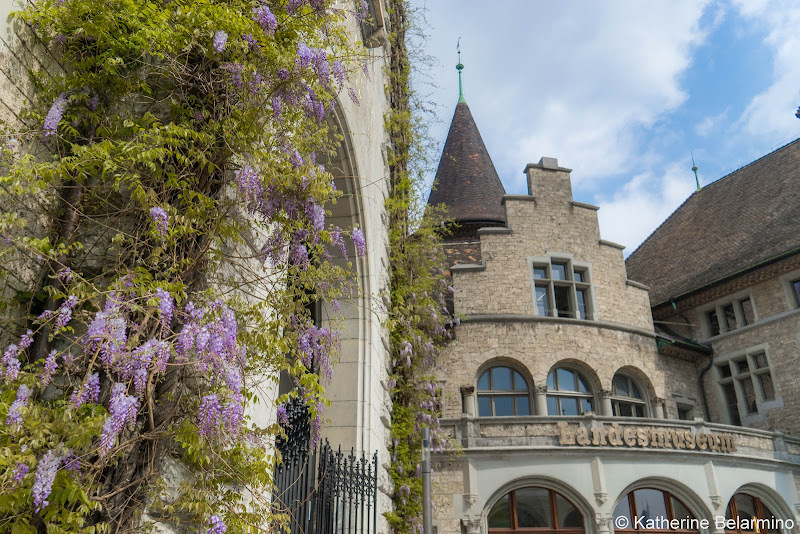 With all of Switzerland’s nature, some guidebooks will suggest not even stopping in Zurich. 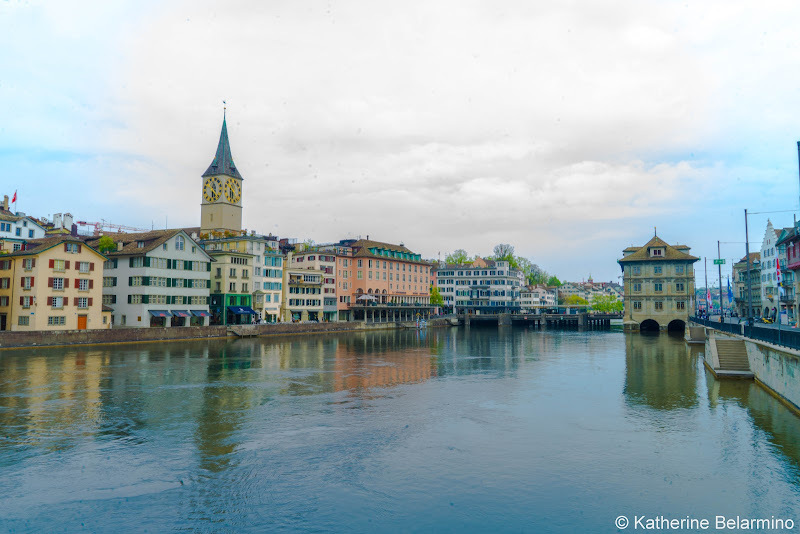 While we also were anxious to see Switzerland’s natural beauty, we did want to give Switzerland’s cities a chance, plus we were flying into Zurich, so we spent one entire day exploring Zurich. 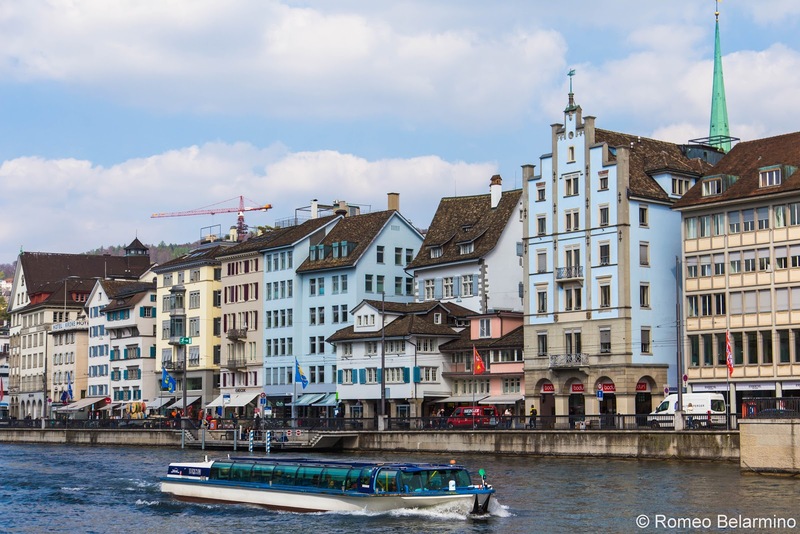 While there are enough things to do in Zurich to keep one occupied for longer, we found that one day in Zurich gave us plenty of time to see the highlights. We started our day in Zurich with a stroll. While we knew we would be taking a walking tour late in the afternoon, we wanted to see Zurich at our own pace, take lots of photos, and be able to go inside some of the places we passed. 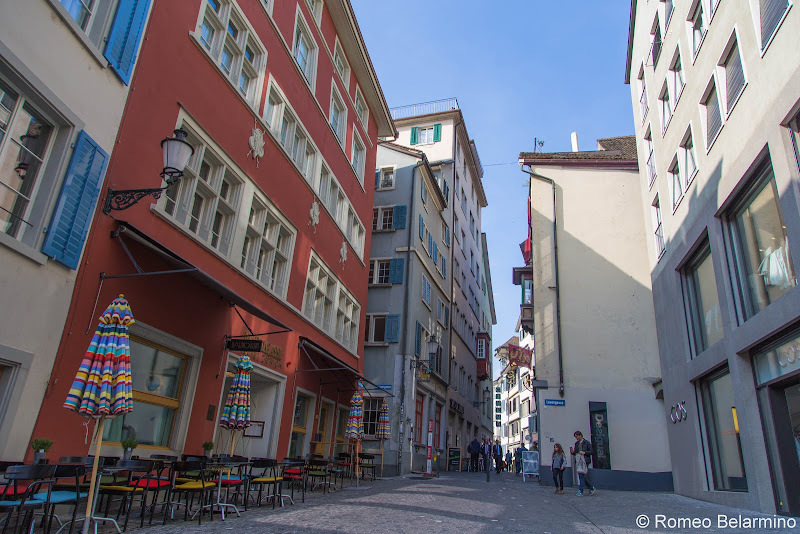 While you might think the best place in Zurich to walk is along the water, Zurich has some great old streets away from the water, including Niederdorfstrasse. This narrow cobblestone street zig-zags parallel to the water and is lined with shops and restaurants. We almost never pass up a chance to take a boat cruise when visiting a city with a river. They are always a good way to see the city from a different angle. 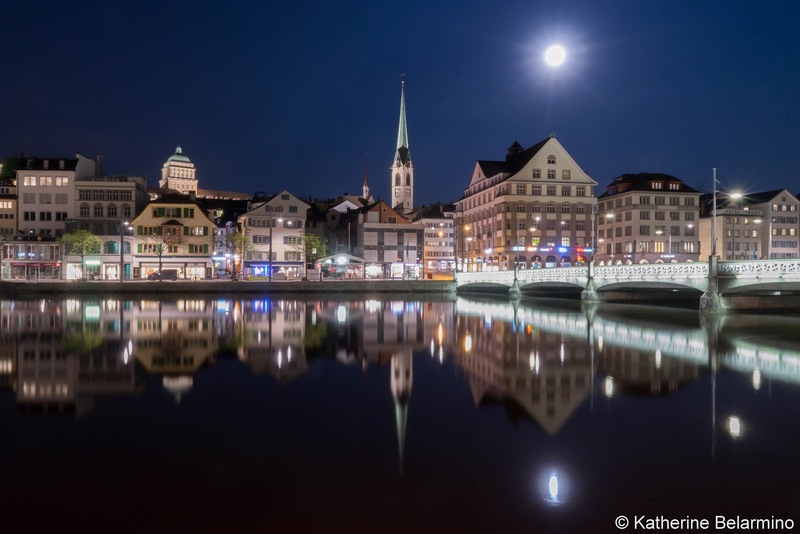 The Limmat Cruise takes an hour and is covered by the ZurichCARD, though there is a CHF 5 surcharge. 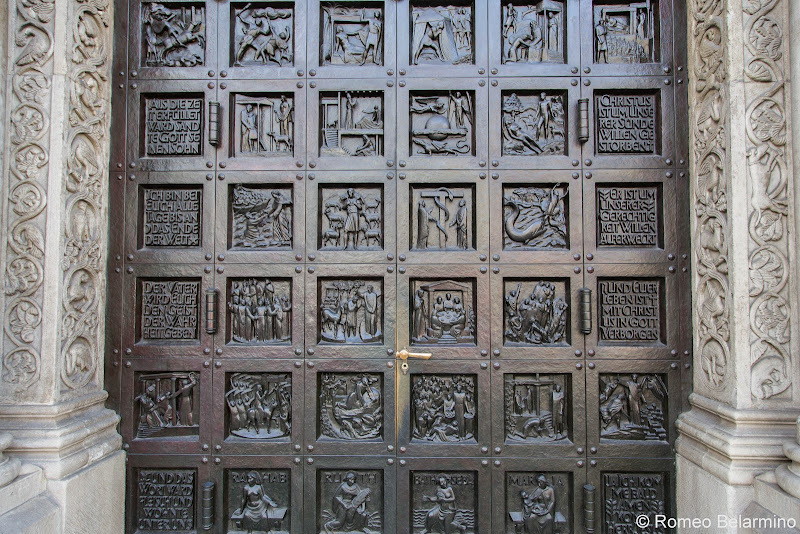 There are two important churches in Zurich, Fraumünster Church and St. Peter’s Church. While both churches are old, neither is very decorative because all adornments were removed during the Protestant reformation. While murals and paintings were used way-back-when to teach bible stories to the illiterate masses, the Protestants believed these verged on idol worship, so what used to be colorful walls and ceilings turned into plain, whitewashed ones. Fraumunster Church has the somewhat recent addition of color in the form of five large, brightly pigmented stained-glass windows by Chagall. Each window has a theme color of red, green, blue, or yellow. There are faint signs of what used to be in Mary’s Chapel, where figments of frescoes are barely visible. 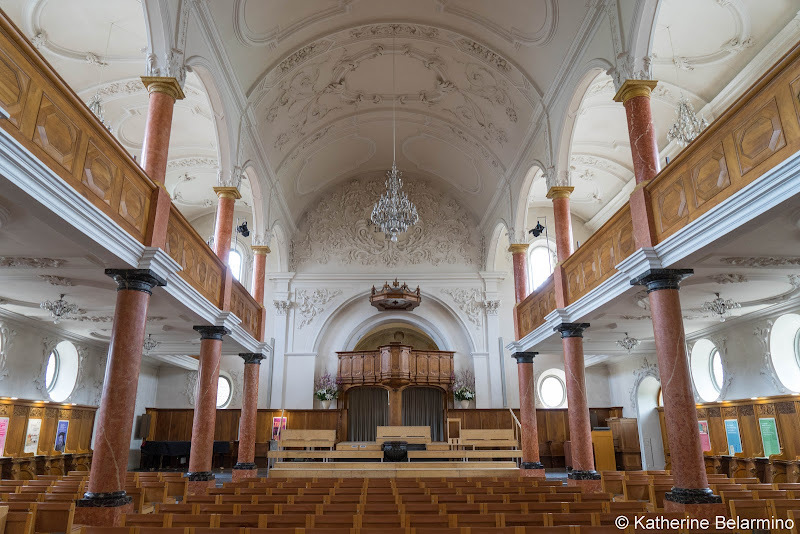 It is worthwhile to use the audio-guide to learn more about the church’s history. 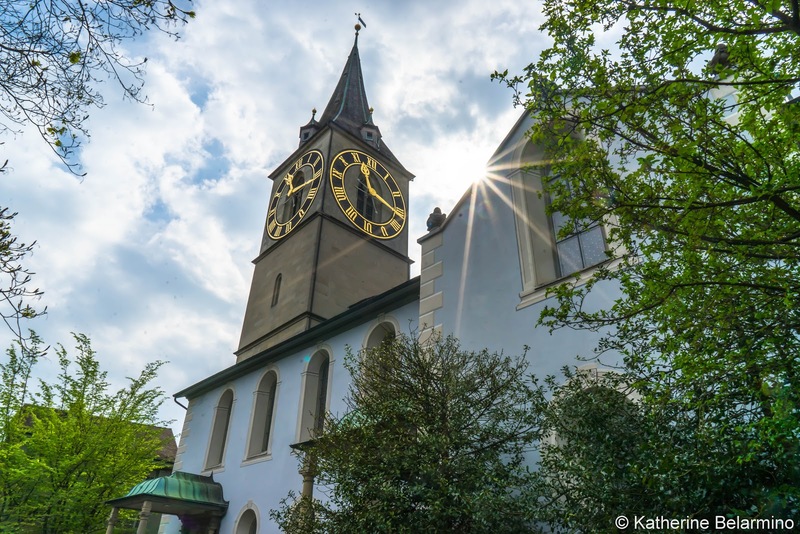 The oldest church in Zurich is St. Peter’s Church. It is also plain inside, but does have sparkling crystal chandeliers. What makes this church special, besides its age, is the huge clock faces on each side of the clock tower. The clock face is the largest in Europe, at 8.6 meters, making it even larger than Big Ben. For good measure, we added one more church to our list, Grossmünster. This church has more modern stained-glass windows, but interesting just the same. Some of the stained-glass windows look like thinly sliced geodes pieced together. Another window looked like it was made for little girls with its bright pink glass. 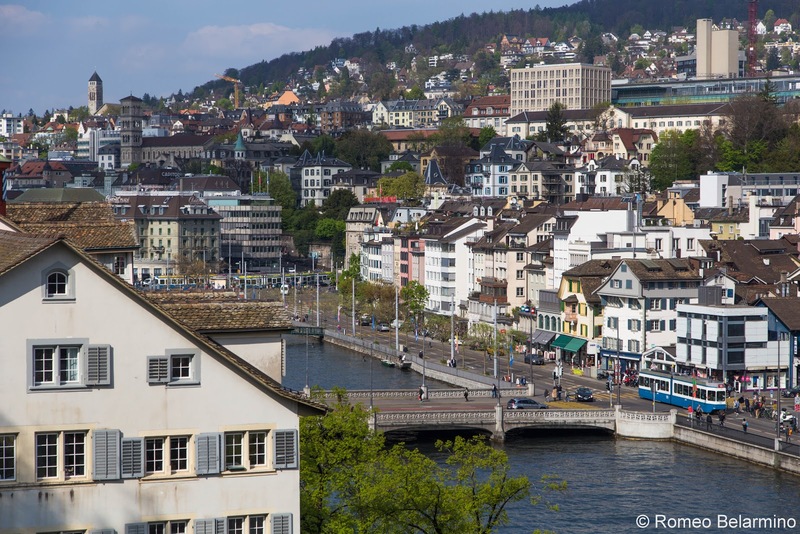 If you want to get some exercise and a birds-eye view of Zurich, you can climb one of the towers. 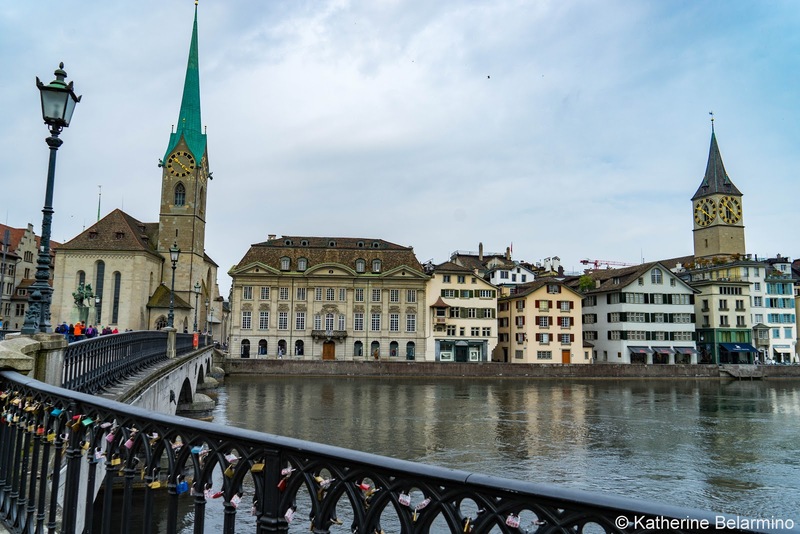 With only one day in Zurich, we didn’t want to spend too much time in museums, though there are plenty. However, one museum is worth a visit, even during a short visit. The Swiss National Museum tells the story of what made Switzerland what it is today. Entrance to the museum is free with the ZuirchCARD. 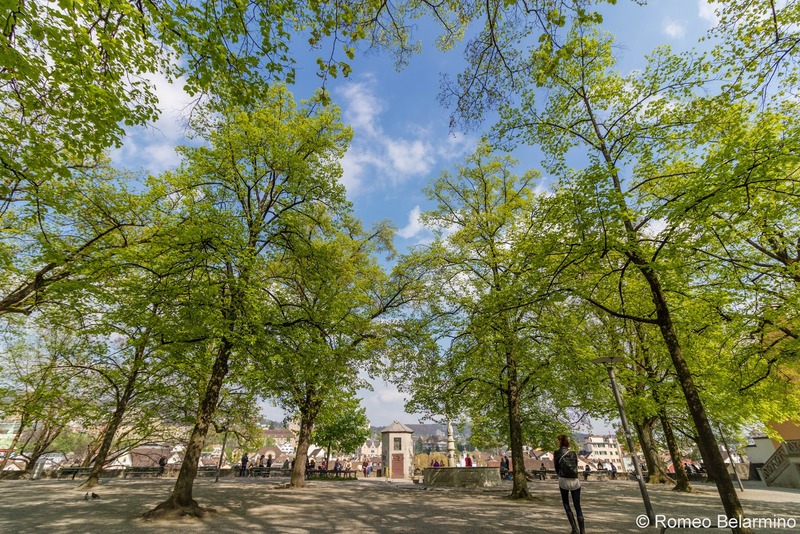 While we had already covered some of the same territories on our own walk through Zurich, we enjoyed joining the two-hour Stories of the Old Town walking tour of Zurich. 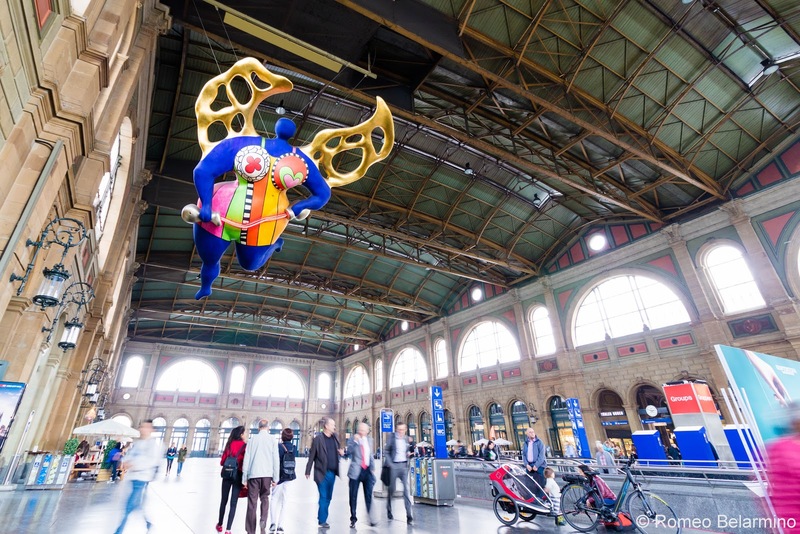 The Zurich walking tour starts in the train station, which is one of the busiest train stations in Europe and is guarded by the Guardian Angel statue by Niki de St Phalle which floats overhead. We learned about the city’s Roman past and walked along the street where Lenin once lived. We drank in the view of Zurich from The Lindenhof, a hill upon which a Roman castle once stood. We even stopped for a refreshment consisting of a mix of a berry syrup and water from one of Zurich’s many fountains. 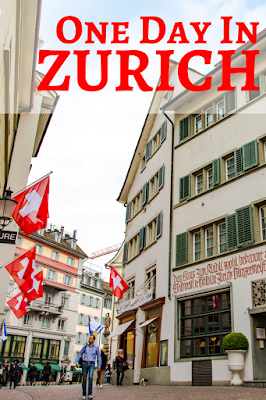 Visitors receive a 50% discount with the ZurichCARD. Zurich is especially pretty at night. 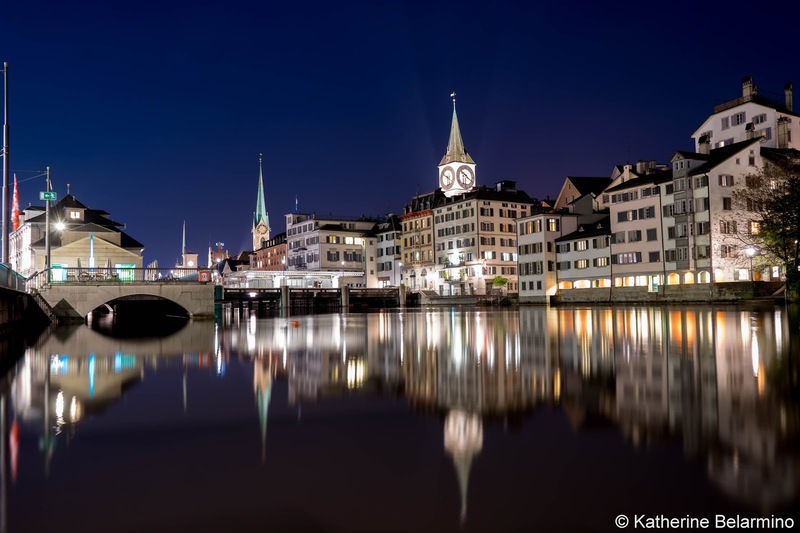 Its situation along the Limmat River with the night lights reflecting off the water and its church spires jutting up into the sky make for a picturesque ramble. 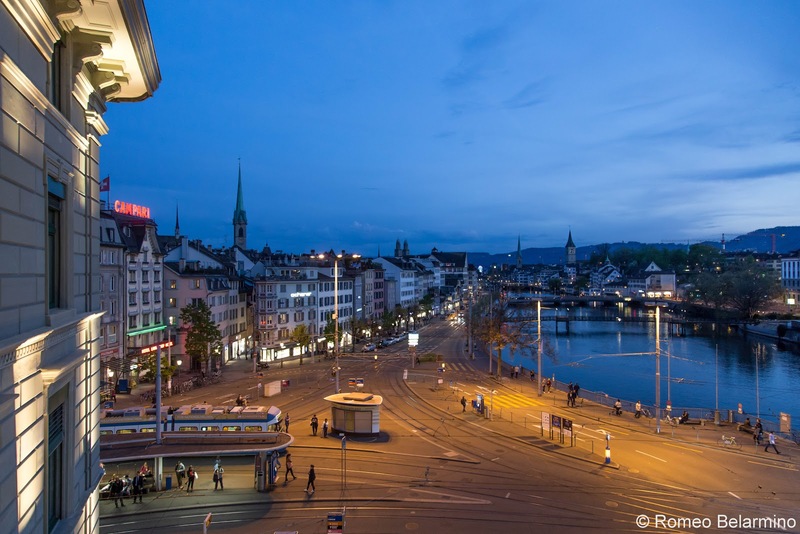 The Central Plaza Hotel Zurich is conveniently and centrally located, with a tram stop just outside. We received an upgrade to a junior suite, so had a lovely view of the river from two angles. We arrived around 8:00 p.m., which is just the start of sunset on an April day, giving the sky a lovely red hue. When we flung open the windows, we could hear the hustle and bustle outside, making us immediately feel a part of the city. Not that our room was loud. Once the windows were closed, our room was peacefully quiet. But I enjoyed inviting the sounds of the city inside. 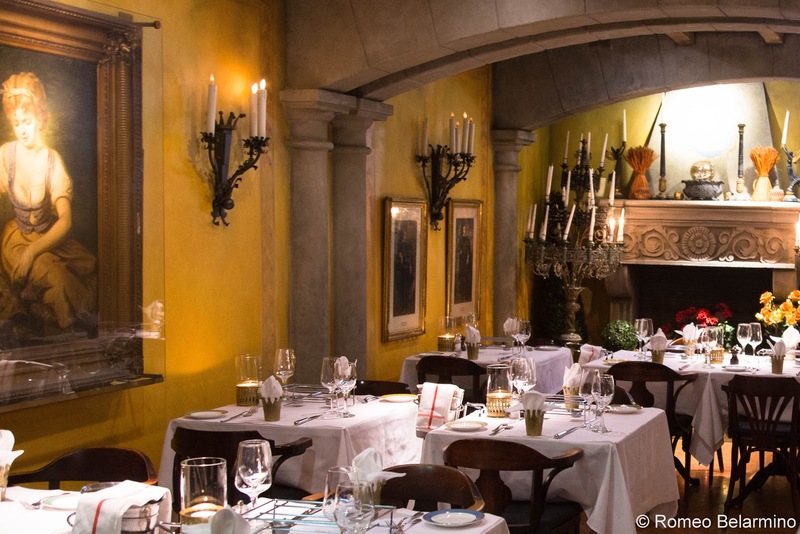 We ate dinner in the King’s Cave, a basement restaurant made to feel like you were eating in a more intimate banquet hall, with white-linened tables for two with candles and champagne buckets, but also a little kitsch with portraits of old royalty, candelabras, and a big fireplace. While we enjoyed our dinner of Swiss beef entrecote, prawns, and sea bass, we were amused by the tunes of the Central Bar’s piano player which reached down the stairs. The set list was an eclectic mix of Budapest, We Are Family, and Don’t Go Breaking My Heart. The King’s Cave is known for their grilled steak entrees, which were tender and perfectly cooked. We were also able to accompany our meal with our first glasses of Swiss wine. 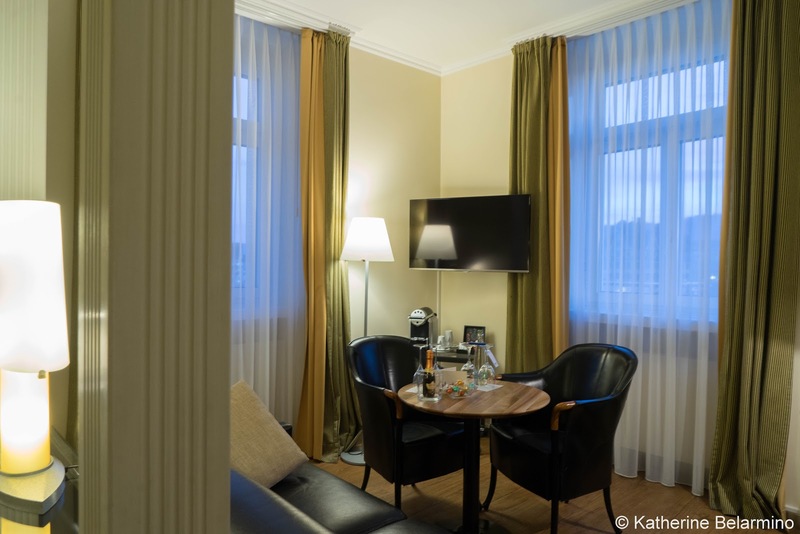 Guests staying at the hotel, up to two persons per room, get 20% off their entire meal, including wine, which was quite a welcome surprise given how expensive Zurich is. While almost everyone we know prefers to use public transportation when going from the airport to the hotel when traveling abroad, we usually take a taxi. Unless, that is, the public transportation is ridiculously easy like it is in Zurich. We were traveling with a Swiss Travel Pass, so all we had to do was exit the airport, walk across the street to the airport complex, head down the escalators, and board the train. If traveling with a ZurichCARD, it’s just as easy, except you have to stamp your card at the little yellow box to initiate it before taking the escalator to the train platform. One 12-minute train ride later we had reached Zurich’s train station. 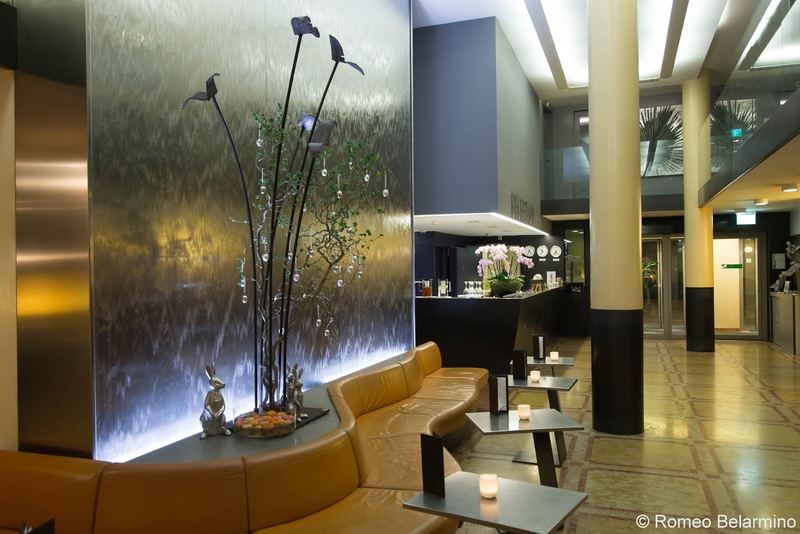 There was a taxi stand and a tram stop, but our hotel, the Central Plaza Hotel Zurich, was just a three-minute walk away. The walk was easy, smooth, and flat, and as soon as we reached the river we could see our hotel just across the bridge. We hadn’t been sure if we were making the right decision to spend time in Zurich, but after the fact we are glad we did and would suggest anyone traveling to Switzerland spend at least one day in Zurich. 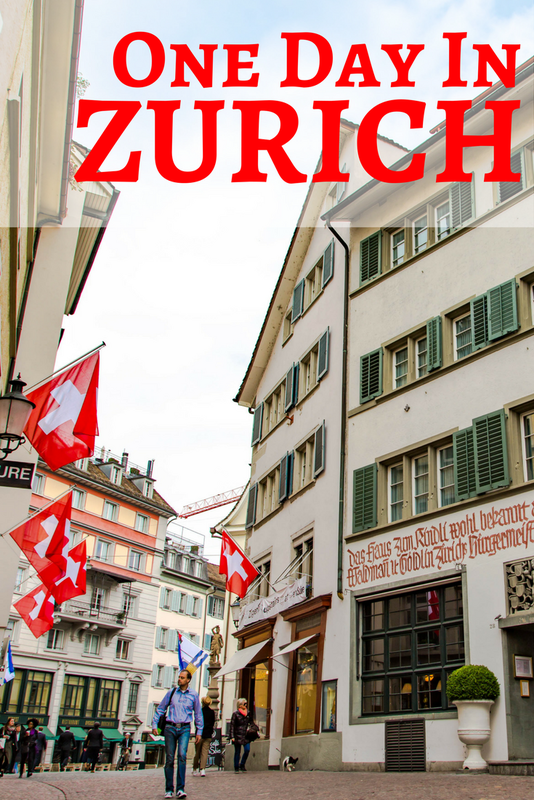 Thank you to the Central Plaza Hotel, Zurich Tourism, and Switzerland Tourism for hosting our time in Zurich and making this post possible. As always, all opinions are our own.